Siegfried faces his most challenging foe: Fafner, the dragon who guards the Golden Horde and must be defeated! Come and see the epic battle! Listen to the amazing music! Once again under the creative direction of Issac Selya, Founder and Artistic Director of QCCO, and WSC members providing support in set design and construction, marketing and promotion, stage direction, and prop development. 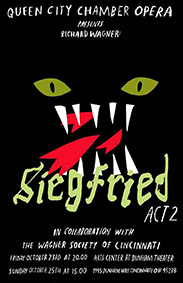 Ticket information: (800) 838-3006 or http://siegfried2.brownpapertickets.com/.